Besides the commission, there are additional costs involved with selling a home that most sellers don’t realize. “What closing costs do I have?” is a frequently asked question. So, let’s say you list and sell your home for $300,000 and your property taxes are $6,000. This is what the simple seller’s side of a closing statement may look like for a closing date of October 31, 2017. Purchase Price: The amount agreed to by the Buyer and Seller for the sale of the property. Tax Proration: The seller credits the buyer the amount from the 1st day of the year to the day of closing for property taxes. At the end of the year, the buyer pays the entire property taxes bill. Mortgage Loan Payoff: This is the amount the seller owes the mortgage company and must be paid off at closing. Title Insurance: This assures the buyer that the property is being transferred to the buyer free from all defects, liens, and encumbrances. Special Assessment Letters: A fee charged by the title company to gather information from the municipality regarding taxes, assessments, sewer/water, etc. 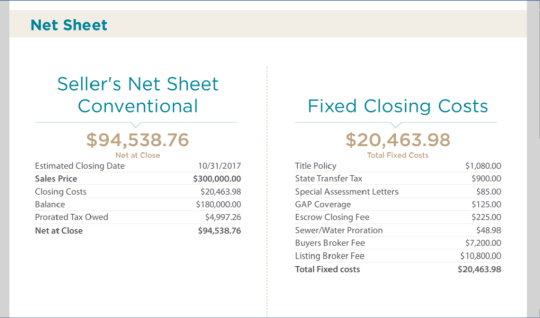 Gap Coverage: The “GAP” is the time period between the date when the title commitment is issued to the buyer and the the actual recording of the seller’s deed. Upon recording, an actual title policy can be issued by the title company. In Milwaukee County, the recording can take many weeks. In between the date of the commitment and the date the deed is recorded, title in the public record is in the name of the original seller. Technically, but illegally, the former owner can use the property as collateral for a loan or other collateral-type transactions. Escrow Closing Fee: The fee to the title company to prepare all of the closing documents and attend closing. State Transfer Tax: Fee charged by the state at $3 per thousand. Take the total of the closing costs and subtract it from the Purchase Price along with the tax proration and mortgage payoff and that will give you the net proceeds the seller will take home at the closing.